Congratulations Team Sadie 2013 This entry was posted in Blog. Only 364 days until race day 2014! Can you believe the day we had? Record rain all but halts for the mere hours we ran & celebrated in Baltimore. We celebrated Sadie, her legacy, our health, our supporters, those doctors who sacrifice their time for their patients, and the families that benefit from the expertise of those doctors and nurses. Praise God. We have received many, many donations over the past week. We would encourage all of you to include a photo of yourself or the team and send out a thank-you letter/email to your family and friends asking for their support. Remember you have one more week to meet your fundraising commitment of $250 by this Saturday, October 19th. 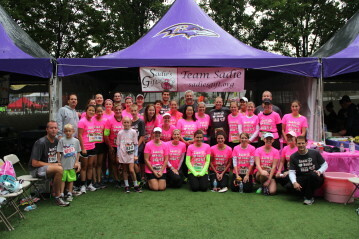 A donation can be made on our Team Sadie 2013 fundraising page or checks can be made out to:Johns Hopkins Children’s Center/Sadie’s Gift and mailed to us at: 2510 Jonathan Rd., Ellicott City, MD 21042. We need your pictures! Please share your pics with us via email or by posting them on our Team Sadie Facebook page. You can check out our 2013 album HERE. Thank YOU for choosing Team Sadie this year. Thank YOU for recruiting runners. Thank YOU for telling us how excited you are for next year. Thank YOU for sending out all those fundraising letters/emails/posts helping us to meet our goal by 2016. Frank’s Wine, Beer & Spirits has provided our post-race beer and champagne for the past four years. Even though he couldn’t make it down to run with us this year, Frank continues to support your Team Sadie experience. Tina Giorgio & Mike Grim provided all of our water & gatorade. Tina came to us 7 years ago asking if we needed any water for race day and she has been providing it ever since. T-Bonz Grille donated our lunch buffet for the second year in a row. They don’t give us a discount. They give us a lunch buffet – incredible. We will have a thank you night at T-Bonz in a couple weeks and will be sure to share the date with you. Our People: We could NOT do race day with out our Team Sadie peeps. Chris & Peggy Wolf set the tent up in the morning and never stop until we’re done. To quote one runner, “It is a well oiled machine” and it is a direct result of these two! Jeff Rives gets up before the donut man to wait for the bagel & coffee shop to open on race day. He delivers bananas/coffee/bagels, pitches tents and ices beer. These three don’t go home until everything is broken down and packed up for the day. Jeff recruited extra help in Eric Schrott this year who dutifully shadowed these greats and provided much needed relief when necessary. Jen Jackson fights the traffic of race-day and counter-terrorism just to deliver your lunch. This year she even had to do it twice! Our friend and neighbor Eric Kettering not only created our new Sadie’s Gift Video this year, he once again secured some race day TV coverage for us. We will share it with you soon. We had our own Team Sadie massage tent this year! How crazy was that? John & ‘Shelly’ Cox brought their magic hands to the Baltimore Running Festival this year and even recruited their friend Stephanie to help out. Three masseurs make for 150 happy runners! Save the date! 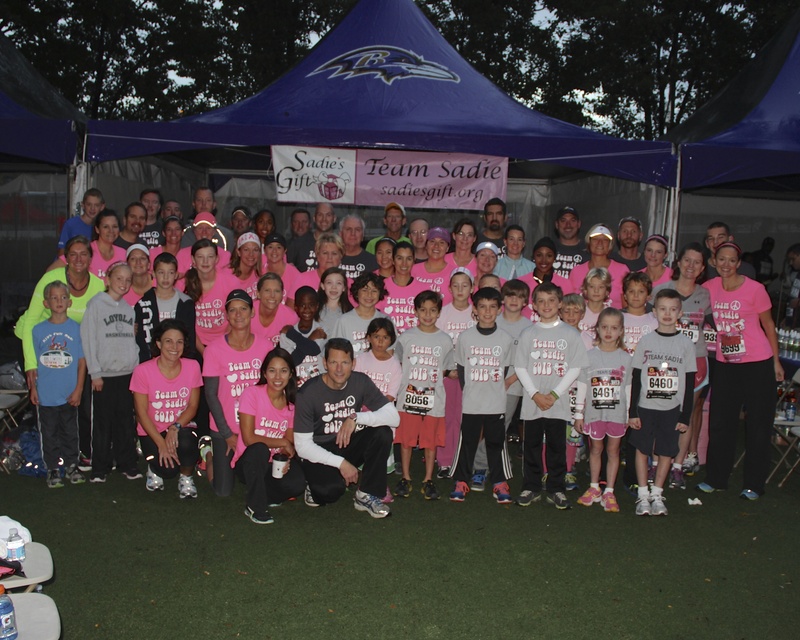 Team Sadie 2014 will run again on October 18th next year. We are excited by so many of you who plan to join us again next year. Thank you all again for making Team Sadie a success this year. Congratulations on all your accomplishments. We remain honored to share Sadie with all you. Give us your email address to stay connected to Sadie's Gift. Click here to find out how you can be a part of all things Sadie's Gift! Team Sadie 2016 will be running in all races of the Baltimore Running Festival on October 15th!